CSX Transportation said today that the wall that buckled and sagged Monday on 26th Street is not owned by the railway but by Baltimore City, which is responsible for its inspection and maintenance. Laura Phelps, a spokesman for the Jacksonville, Fla., conglomerate, confirmed reports given to The Brew by two sources that the upper concrete wall that partly collapsed yesterday is on city property, while a lower stone wall, owned by the railroad, was undamaged. 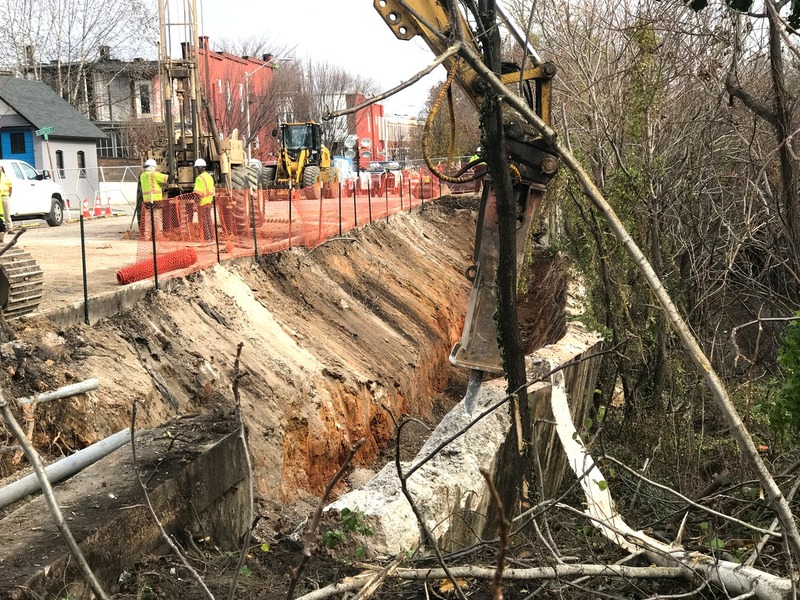 It was the upper wall, saturated with water, that pulled away from the city sidewalk on 26th Street near Calvert Street, shifting the wall southward toward the CSX line in the gully below. After another wall along 26th Street collapsed in 2014, CSX and the city entered into an agreement about the inspection and maintenance of walls along the rail route. The city Department of Transportation pledged to inspect all of the structures along the CSX right of way. Today, excavators removed about a 75-foot section of the buckled sidewalk and dug out mud and stone, exposing the badly warped concrete wall. Phelps said work is being conducted under the joint supervision of the city and CSX. She said she did not know who was paying for the costs of excavation. DPW and DOT have not responded to questions by The Brew about the ownership of the upper wall – or who is paying for the reconstruction. CSX people on the ground also expressed the opinion that a city water main project along 26th Street may have contributed to yesterday’s wall damage. 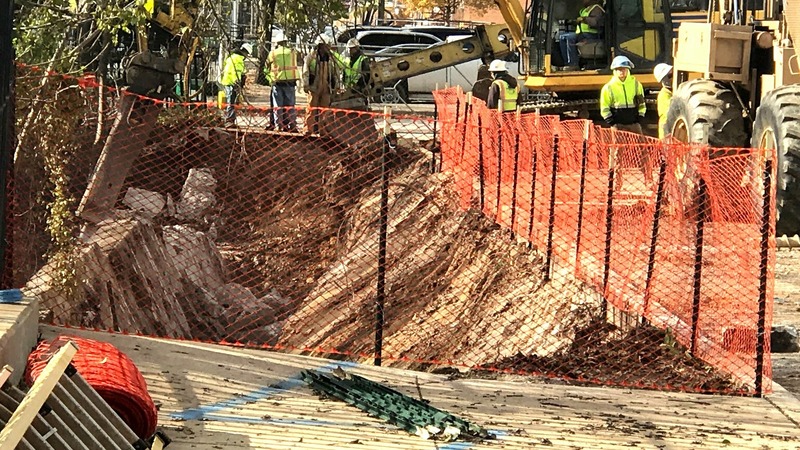 “Our current understanding is that water main work nearby may have undermined the wall – that is, the upper-portion of the wall owned by the city,” said one person. DPW has not responded to this assertion. Phelps said CSX will not comment at this time, saying it is too early to determine the cause of the wall failure. After crews excavated the dirt from the upper wall early this morning, CSX began running freight trains at a slow speed through the damaged area, Phelps said.